Love for Food Box Only $5! I recently wrote about all the different subscription boxes with food & drink items available. Today, I saw that Mamasource is offering a 1 month subscription to Love with Food for only $5, plus $2 S&H. Love With Food is the easiest way to discover what’s tasty, delivered to your door! Every month, Love With Food members will receive a curated box of unique, hard-to-find tasty bites which varies based on seasonal themes. Say goodbye to boring grocery selections and HELLO to a monthly tasty surprise! As a Love With Food member, you’ll get to sample different products each month, earn points by leaving feedback and enjoy exclusive discounts to all full-sized products featured in your box. Use your points to buy products for FREE. In our online community, you’ll also discover great recipes and other food enthusiasts. At Love With Food we treasure our customers. 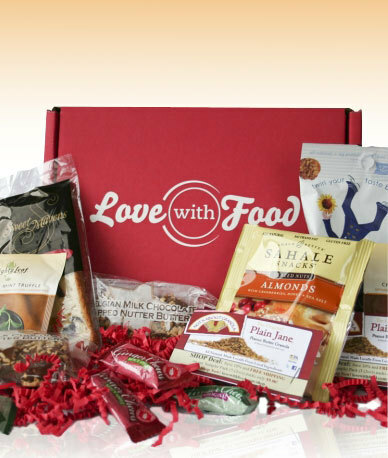 Every customer who buys our Love With Food box or featured products earns valuable points. Use your points to get products for FREE. Yeap, it’s on us! Don’t forget, 5% of all your purchases through Mamasource will be donated to the school of your choice. I just love helping out the high school I graduated from every time I score a great deal!